See Optometry in Your Future? If the notes on your teachers’ whiteboards are hard to read, what do you do? Chances are you visit an optometrist. You may need glasses, or you may get fitted for contact lenses. Whatever the solution, optometrists help the world see as perfectly as possible. But what exactly do optometrists do, and how to they learn to do it? 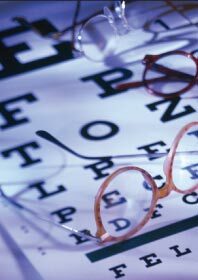 In the most basic terms, optometrists counsel patients and help improve vision needs related to their occupations and general lifestyle. This can be through noninvasive treatments, like glasses or contact lenses, or in some instances through surgical options such as laser, refractive, or glaucoma operations. Optometrists examine the internal and external structure of the eye to diagnose systemic diseases, such as hypertension and diabetes, and vision conditions, like nearsightedness, farsightedness, astigmatism, and presbyopia. A career in optometry can be a rewarding one, both because it improves patients’ quality of life and it provides many professional advantages. In 2010, an AOA member survey found an average net income of $142,645 for the primary practice of optometry. The Bureau of Labor Statistics predicts employment will grow by 33% from 2010–2020, more than double the average of all occupations. But it’s about much more than money for many O.D.s. Optometrists will often open their own practice, providing them with ample independence. Other common career paths include those in public health, hospitals and clinics, government, military, corporate practices, or teaching institutions. Optometrists, like many specialists, have very reasonable working hours as well. In general O.D.s practice “full-scope” primary care optometry, in which they treat and manage all forms of visual and ocular conditions. Sometimes optometrists choose a specialty, such as ocular disease or geriatrics. And because a four-year optometry curriculum prepares grad-uates for all areas, residencies aren’t required to develop a specialty. So how can you become an optometrist? Most optometry programs require a bachelor’s degree, or a minimum 90 semester hours of college credit. Prerequisite programs vary, but most include biology, general and organic chemistry, physics, math, and English. All schools of optometry in the United States and Canada require a passing score on the Optometry Admission Test (OAT), a standardized exam designed to measure general academic ability and comprehension of scientific information. The OAT measures students on four areas: natural sciences, reading comprehension, physics, and quantitative reasoning. At least one year of college is required to take the exam, but most students elect to complete two or more years before doing so. When applying to an optometry program, prospective students need to use the Optometry Centralized Application Service (OptomCAS). This enables applicants to fill out one application and send it to multiple optometry programs. All 21 ASCO member institutions accept the OptomCAS, and the application fee depends on the number of schools you want to receive your application. ASCO encourages prospective students to have some exposure to optometry, in addition to collaborating with at least one optometrist to observe what they do on a daily basis. Most schools also require an admission interview, where prior experience can be a significant asset. For compassionate, dedicated students, optometry may be a clear vision for your future. This article was written in collaboration with the Association of Schools and Colleges of Optometry (ASCO) Recruitment Materials Task Force.